A collection of various tools, files and other resources that may help you in your adventures in Erinn. 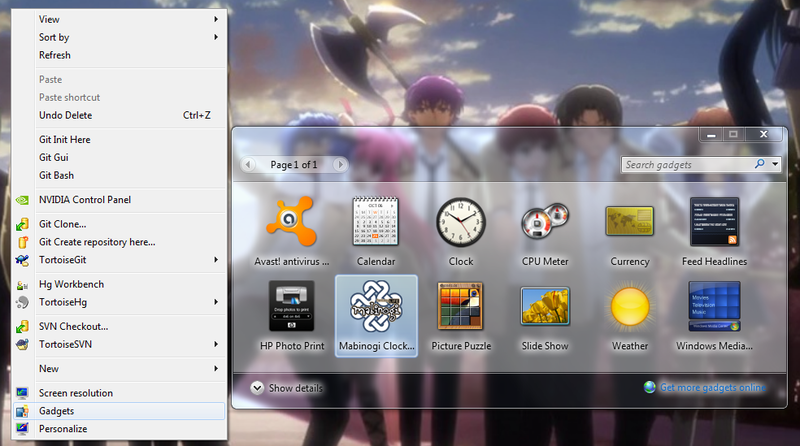 Clock Gadget for Mabinogi for Win7. Display Price Location with on Map Location, Display Rua Work Schedules, Display countdown until next Fleta Appearance. Allow No NPC Portrait ability for more screen area. Allow manual game clock sync through setting option up to 59min 59sec differences. Those who downloaded before hand, make sure the version is 1.2.2 or you will have incorrect times. Also request: KR Bebhinn / Ysolte. Seemed like a Scathach only issue after clock adjusting. Try ver 1.2.3, can't pinpoint the exact issues yet, just don't that portrait for now. Sky wrote: Also request: KR Bebhinn / Ysolte. Alright, alright... working on it. Yeah, I used Rua and when I restarted it seemed to work fine. Sky wrote: Yeah, I used Rua and when I restarted it seemed to work fine. Yea, I have the fix for it done awhile ago, I'll upload it soon. When I close the gadget the settings don't save.